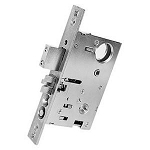 Emtek Thumb by Knob/Lever Mortise lock body in 2-1/2" and 2-3/4" backset ANSI F20 and ANSI F13. Q: What is the difference between the 3300 and 3380? A: The 3300 works with a thumb by lever or knob mortise set and the 3380 works with a knob by knob or lever by lever mortise set.